WRS Health Integrated EHR Billing and RCM features a single, unified system. This enables automatic charge capture and claim creation. Move your patients through the workflow and create an encounter note. The claim automatically is created and populated with appropriate demographics and charge codes from that visit. Just press SUBMIT and the claim is on its way to the payer. With a powerful rules engine, claims are scrubbed and submitted all within the EHR workflow. Tools such as the E&M Coding Advisor and practice customizable Electronic Superbill make charge capture easy and accurate. Just chart your procedure and it is automatically queued for billing – no paper superbills or their dual entry to worry about. Services performed are services charged and paid. WRS Health Integrated EHR Billing clients have the lowest claim denial rate in the industry. When a claim is rejected, you immediately see the clearinghouse or insurer denial reason so that rejected claim can be instantly corrected and resubmitted. We don’t make any more billing mistakes. We learned our lesson. Compared to the billing we had before, WRS generally saves us two to three hours a day. Billing integration made seamless has been a highlight of WRS Health. In addition, being completely web-based has made my workflow that much easier. I find the WRS Health web-based EMR and PM to be simpler and faster than any system I have used in the past. Claims show up faster than ever; WRS' billing module is a plus to any practice. I have appreciated the system from day one and it gets better every day; the support is great. Since implementing WRS Health ' EMR system my job is easier. With our payment and posting workflow, money is deposited in the bank and the payment is entered, posted and adjusted – all automatically. Electronic payment happens on average two weeks sooner than paper checks, dramatically improving impact on your cash flow. By tightly controlling the payment and posting workflow, your billing staff is freed up to handle higher-level billing functions. Your front desk is alerted with the correct amount of the patient responsibility for co-payment, deductible and coinsurance at both check-in and check-out so that payments can be made before the patient leaves your office. Electronic deposits and automatic payment are integrated within the system. Faster than paper checks, you will improve your cash flow. Credit card processing and online bill payment are also fully integrated without having to go to a separate portal or third party software. When payments are made to the office, associated electronic payment entry, posting and adjustments are done seamlessly without any additional work. Greater security with HIPAA compliant patient e-statement designed to eliminate confusion and unnecessary calls. Patients receive a single statement regardless of the number of providers they see. Our integrated EHR billing and revenue cycle management system provides real-time reports such as activity, aging, demographic. You can have reports customize to the data and parameters you choose, including graphs and trend snapshots. Your report can be saved and set to run automatically. WRS Health can also handle all aspects of your billing. When we handle your billing, you also get monthly one on one reviews with the billing manager overseeing your account. 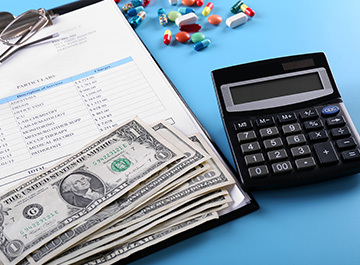 For more information on the WRS Health Medical Billing Services. To have a well-run medical office, billing can't be separated from registration, charting, scheduling, patient portal, and other functions in the system. All interactions are designed to capture accurate data as well as to alert you when there may be an impact on billing. Over 50,000 claims rules power through our advanced rules engine. Local coverage decision ICD-CPT crosswalk edits and Correct Coding Initiative CPT bundling edits happen automatically. We directly access the CMS database on a quarterly basis to provide you with the most up-to-date rules instantly. We combine this data with real-time form edits to ensure items like insurance card number and demographic data are entered correctly. This helps ensure that you get paid correctly the first time a claim is submitted. Evaluation and Management Coding advice and alerts shouldn’t happen after the encounter. When you are charting your encounter, the advanced E M advisor will help you ensure compliance and inform you of note elements necessary to code at the correct level. The WRS Health patient billing and payment system helps ensure that patients are held financially responsible for the correct balance in a timely fashion. As patient payments are assuming a larger portion of the total reimbursement for services rendered, having a system in place that ensures payment while preserving your patient relationships is more important than ever. In the few instances where collections are necessary, you can feel comfortable that your patients were billed the correct amount in a timely fashion. We know how important your patient relationships are to you – the system helps preserve this relationship with a professional, accurate and timely patient payment workflow.